Is my face red? How do you Define Love? I attempted to write an article for my Thought Post, had the idea and everything, but something got in the way. Love. My son’s very first baseball game. Oh, I arrived home with plenty of time to write the article, but it requires too much brain activity, and that’s something I don’t have at the moment. Why? Love. I’m allergic to the sun and to heat. My son had to be at the fields at 11:45 for the parade of teams and the first pitch to be thrown out by a future NFL wide receiver expected to be drafted in the 4th or 5th round. “B” as I call my son here in Blog World, was very excited. He actually had him autograph his cap in a specific spot so the signature would not get rubbed and messed up. My son thinks a lot. Not sure where he gets it from. After 4 PM on a beautiful sun filled day and a winning score of 12-2 I managed to get back to the car. Barely. Very dizzy. 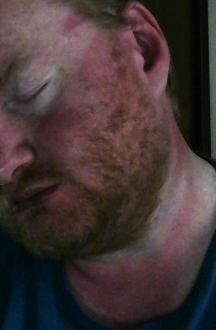 And even though I had 50 SPF on I was sun burned badly. Even through my shirt. Yes, apparently my allergy has become worse. But why did I risk it? Love. I took precautions. I felt the heat, but I always do. I knew I would get burned a little. I knew the migraine I am in the middle of as I write this would be this bad, okay, I didn’t know it would be THIS bad. I can’t say I remember the last one that spiked this badly, but I have a dedication to this blog and my friends for some reason. My son needed me there his first game. And I WANTED to be there. That brings me to my question today, and I may compile the answers into a future post. What is your definition of love? Or, how have you demonstrated your definition of love before? You might also do a post of your own with your definition and example and leave a link to it in a comment below for others to read. But please let it be a new post, not an old post. Being too sensitive? Have those words ever been thrown in your direction? I’m not even absolutely certain what that even means. Too sensitive according to what definition? Would people rather I be too insensitive? What some call too sensitive is what I would call caring sincerely. I care about my friends. Let’s take having author friends as one example. I read for other authors at times, we call this Beta-Reading, test reading. If you see it spelled another way then it is wrong. B.E.T.A.-R.E.A.D.I.N.G. For me that reading carries over to the published book. If I read a friends book that is already out there for the world to buy and I see typos, I make note and let the author know about it so they can correct them if they wish before a review comes out commenting on them. What if I sat down to write an honest review, which are the only ones I do? Perhaps I am too sensitive when I am told I am wrong and basically that the information is unwanted. Now let’s look at asking people to help with a cause. This past week I heavily publicized a need. The results have not been what they should be. Am I too sensitive when I look a the number of people out there who are aware of it then look at the number involved in it and wonder why there is even a need still there? Why does this lack of cause participation cause me to be sensitive in any way at all? Well I care. I care about people. I care that my friends are people that care as well. And by that I mean care if only a little. I know not everyone can help but I was hoping for more. There are plenty of other things I could say, but I don’t want this to be too long today. Friends, be too sensitive. Those that tell you that you are usually are those that have very little heart to begin with. Some may think they do and are simply think they are helping by saying it but they don’t have the heart. If they did they would understand.